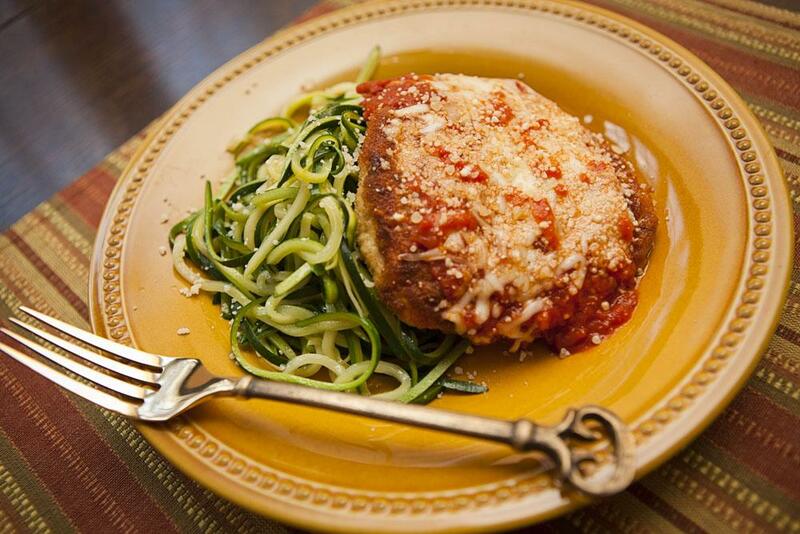 Chicken Parmesan makes a quick and easy meal, whether served on its own with a side of sautéed vegetables, or used to complete a pasta dish. Covered with bread crumbs, many prefer to fry their chicken Parm for a crispy coating – however, a healthier, and equally delicious alternative is to bake it in the oven. Preheat your oven to 350 degrees F (175 degrees C), so that it is nice and hot by the time you slide the chicken in to bake. Lightly grease your 9x13 inch baking dish – for this purpose, you can either use butter, shortening, or light, neutral oil. In one medium-sized bowl, add in the olive oil and minced garlic, and use a spoon to combine the two. 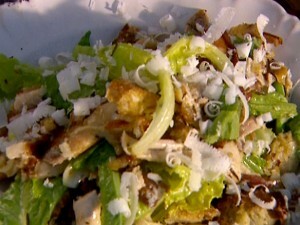 In another bowl, combine the ingredients you will need to make the coating for the chicken Parm. Add in the bread crumbs, Parmesan cheese, basil, and pepper. Use a spoon to completely mix all the ingredients together, until they form a crumb mixture. One by one, pick up each chicken breast – dip it first in the olive oil and garlic mixture, and follow it up by dipping it in the bread crumb mixture. Turn it both sides, to make sure it is evenly crumbed, and once all the pieces have been dipped and coated, arrange them in the baking dish you prepared earlier. Finally, slide the dish into the preheated oven, and bake it for around 30 minutes. Take the dish out of the oven, and allow the chicken to rest for 5-8 minutes before you plate up and serve. Chicken Caesar Salad is to be served right before you eat chicken parm. The after taste will definitely leave you licking your fingers. i know how to make it, i never knew what to serve with it. thank you! That is why we have the ‘goes along with’ section.